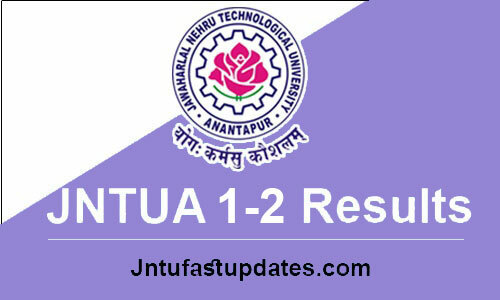 JNTUA 1-2 Supply Results 2018: JNTUA B.Tech 1-2 Sem (R15) Supply Exam Results Dec 2018 declared at jntuaresults.ac.in or jntuaresults.azurewebsites.net. Students may check their JNTUA 1-2 R15 results from links given below. JNTU Anantapur has announced B.Tech I year II Semester (R15) Supply Examination Results December 2018. Students can check their results from jntua official result portal. Actually JNTUA has conducted 1-2 Sem Supplementary Examinations in the month of December for R15 Regulation Students. So many students wrote these exams and eagerly waiting for result date. The university has conducted the 1-2 semester exams from 18th December to 28th December, 2018 And the candidates, who had appeared for the exam, must be waiting for the results since then. Thousands of the students have appeared for the exams. The results of following B.Tech Exam 2018 are declared on September at official website. After declared the result, the sheets have been sent to respective college principals. Students concerned are requested to contact their college principals for knowing the results. The candidates who wish to apply for recounting of theory external marks / challenge valuation / photocopy of answer script should submit the requisitions to their Principals along with the attested statement of marks with necessary fee on or before: 22-04-2019. Results release cheyandi….!!! R13 1st year…!!! Daily vasthundi ani expect cheyadam results vasthayani… Ala chesi chesi 3 months aypoyindi…!!! Results…??? Atlest evala aina…..release chayandi sir….. results…….